ROC 56 Official Announcement | Lou Neglia's Ring of Combat | Next Generation of Mixed Martial Arts! 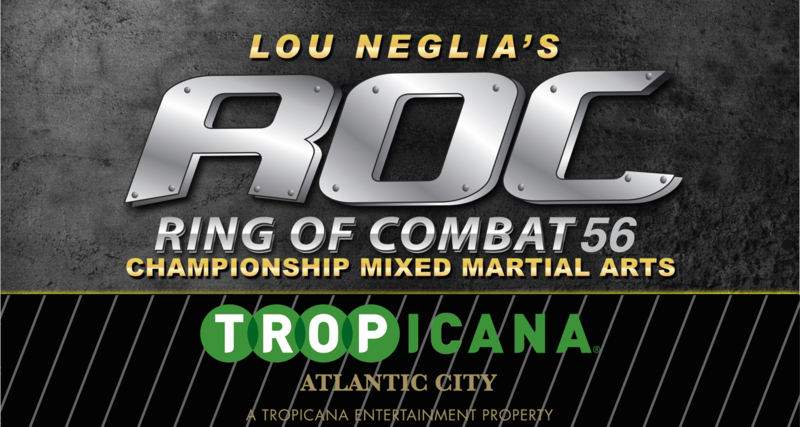 Four title fights are set when legendary world kickboxing champion, Lou Neglia, brings his premier mixed martial arts (MMA) promotion, Ring of Combat, back to the Tropicana Atlantic City, New Jersey, Friday, September 23rd. Out of fifty-six events, Ring of Combat has sent over 100 hundred fighters to the UFC. No other promotion can boast of such an accomplishment. The latest to join the UFC rankings is current ROC flyweight champion, Matt Rizzo, as he joins the cast of TUF 24. The ROC 56 main event has the return of, New Jersey’s Brendan “Brutal” Barrett (10-5-1) defending his ROC heavyweight title for the third time. Riding a six fight win streak, Barrett looks for another impressive win under the ROC banner but Shelton Graves (4-3) has other plans. Coming from Maryland, Graves looks to extend his two fight win streak while capturing gold. The co-main event, features ROC featherweight champion, Frank Buenafuente (6-3), taking on New York’s Nekruz Mirkhojaev (2-0). After winning the title at ROC 55, New Jersey’s Buenafuente is wasting little time to get back in the cage for his first title defense. Coming down from the lightweight division, Mirkhojaev will be the bigger man and plans to keep his undefeated record intact with a spectacular win. Also making the first defense of his newly won title, Eric Roncoroni (5-1) of New Jersey will defend his belt against fellow New Jersey native, Ruslan Melikov (3-1). Roncoroni won the middleweight belt against his rival, Mike Elshamy at ROC 55 with a vicious KO! Now Roncoroni has his sights set on Melikov in what promises to be an all out war. In what could be the most explosive bout of the night, Bradely Desir (8-5-1) makes the first defense of his lightweight crown against Max “The Cobra” Bohanan (6-2). The last time ROC fans seen Desir was in his title winning bout at ROC 54 with a brutal TKO over Eddie Lenoci. Now Desir takes on jiu jitsu specialist, Bohanan, who is coming off a tough split decision loss at ROC 55. Bohanan can put that loss firmly behind him and win gold in one night with one fight! The Ring of Combat 56 non title bouts are: Anthony Facchini (4-2) vs James Gonzalez (1-1); O’Brayan Ramirez (0-0) vs Sukhrob Aydarbekov (1-2); Tevin Cooke (2-0) vs Michael Trizano (2-0); Daniel Branch (1-1) vs Guram Mestvirishvili (2-1); Kendrick Mendez (0-1) vs Wendell Sneed (0-0); Jimmy Santiago (1-1) vs William Elliot (3-1); Merab Dvalishvili (3-2) vs Paul Grant (3-2). Ring of Combat has made a name for itself unlike any other MMA promotion by being the platform that launched the careers of former UFC champions Chris Weidman, Matt Serra and Frankie Edgar along with UFC contenders Edson Barboza, Al Iaquinta, Uriah Hall, Ryan Laflare and Chris Wade. Ring of Combat 56 will take place September 23rd at the world famous Tropicana Atlantic City showroom.